A A former State Street church and rectory are set to become home to six new apartments or condos next year. The City Plan Commission gave its unanimous OK with conditions at City Hall Wednesday night to developer Michael Zauberman of Newcastle Connecticut LLC to convert the former church and its rectory into six residential units. The church and rectory at 847-855 State St. were owned by the Lighthouse Tabernacle Christian Church Inc., but have been empty for years. They stand near the corner of Clark Street, across State from Da Legna, Christopher Martin’s, and Modern Apizza restaurants. Architect Fernando Pastor told commissioners that one of the six units will be fully Americans with Disabilities Act-compliant on the first floor. The design of the conversion will aim to maintain many of the historical details of the church including stained glass windows and the church’s tower, he said. The church, which Pastor said had been abandoned for a decade, was built in 1904 and designed by the 19th century New Haven architectural firm Brown & Von Beren. The plan calls for five units in the church building proper, with two units at the main level and three on a second floor. The sixth unit, the rectory, will actually be a single-family home. The apartments or condos — it hasn’t been decided what they will be other than new places to live — will have three or four bedrooms each. 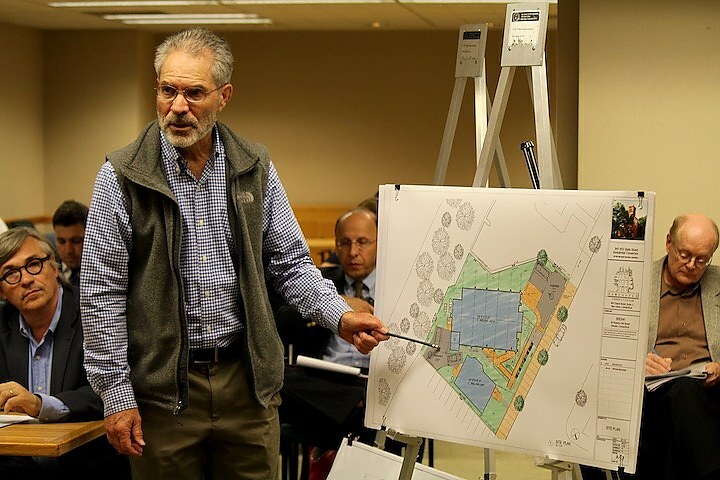 City Plan staff recommended approval of the site plan for project under several conditions including making sure that the eventual inhabitants of the building can gain access through an existing easement at 881 State St.
Zauberman said this is his first residential development in New Haven. He expects it to take a year to complete.